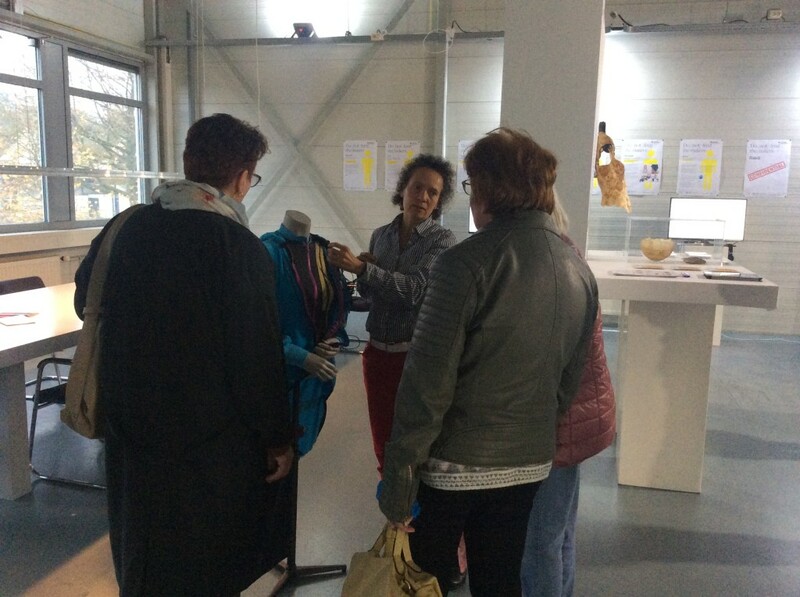 Last week, we had an inspiring day at Dutch Design Week in Eindhoven. 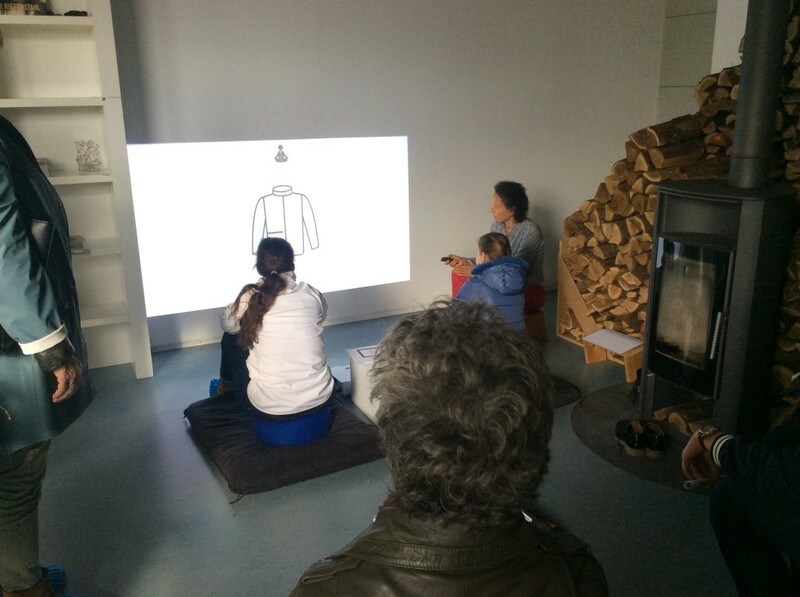 We exhibited the latest prototype of the Silence Suit in the exhibition Do (not) feed the makers and asked the visitors to participate in a virtual tour through the Meditation Lab. We wanted to ask them for some feedback about the procedure of putting on the suit and logging the data of a meditation session. We were well prepared. We created a setting with meditation mats and some tea to welcome the visitors. Beforehand, we made a slide show with icons to show all steps belonging to the preparations before meditating, such as putting on the suit and checking every sensor, starting the computer to fill in de questionnaire about which experiment you are going to do and activating the light instrument. In the course of the virtual tour we explained what is happening while meditating: the detected data drive the light instrument to optimize your meditation session. For example, if your heartbeat is too high, you need some warm white light to relax or if you nearly fall asleep, you need some blue light to focus. The feedback was very positive. Experienced meditators as well as beginners and inexperienced were enthusiastic to think along with our vision. The experienced found it an interesting tool to deepen their meditation experiences. And the inexperienced found it a great tool to facilitate the start of meditating. ‘If there is a light instrument helping you to focus, meditation cannot be that difficult.’, someone said. Danielle was mostly in dialogue with the visitors and I was taking notes to later look it up to check if we can realize some of the visitor’s wishes. The consensus of the day is in my opinion that the data base as well as the questionnaire have to be as flexible as possible, so that the user can customize it easily. The desires about the outcome of the data were very individual. In the course of the day, we also heard some critical voices. 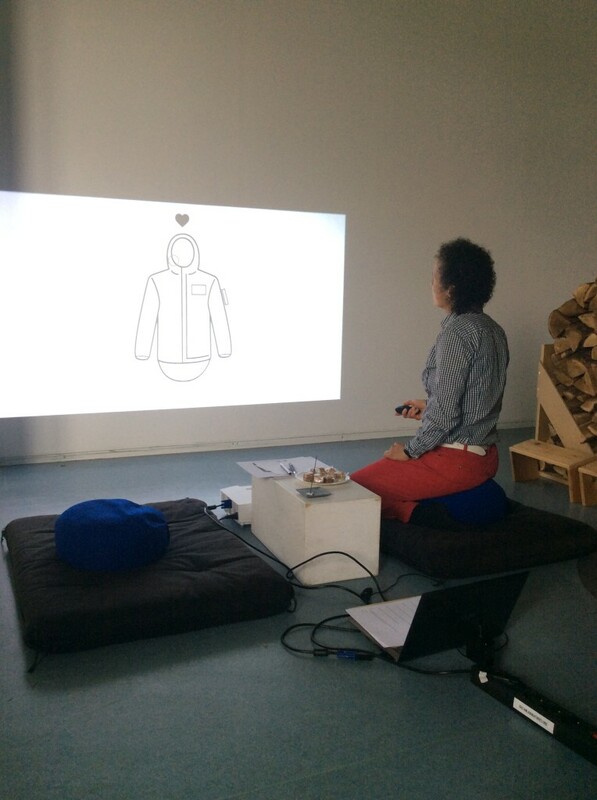 Some of the visitors criticized the use of technology in combination with meditation. Their motivation to meditate would be to free from the media. Some people also criticized the judgement of a good or a bad meditation session. Meditation has to free you from the pressure you experience in your everyday life. For those people it would be great to profit from the light instrument without reflecting on the outcome. I learned, that the Meditation Lab Experimenter Kit is not for everyone. It was never Danielle’s intention to make something everyone is waiting for. It makes her an artist that she realizes a project which seems paradoxical first, but can be really stimulating if you are willing. Staying open for the Meditation Lab Experimenter Kit means to be interested in meditation, technology and self-development. You must not be scared about the combination of spirituality and technology which can be very interesting as the Silence Suit shows. We were very happy about the outcome of this exhibition. I found it very interesting to see how exhibiting, researching and networking can go together. It was inspiring to hear enthusiastic as well as critical voices and it was a great exercise to get in contact with some potential users. We got a list of people who want to know more about the project and maybe want to participate in some Meditation Lab Experiments. Very interesting to read about people’s reaction to Danielle’s Silence Suit. That the questionnaire needed to be flexible and the outcome of the data is individual is something that we constantly we see with personal data. When people are collecting their own data, they often have to personalize it to make it meaningful. Hi Steven, nice to hear from you! The discussions with the public were very useful. I hope to give a more comprehensive overview soon.